This website we are scoping will serve as on-demand service providing platform for companies and nurses over site. Here users can register as a companies and nurses. When companies foresee staff shortages, at the last minute can post the job over the website with all the details like location, number of hours service is needed, number of nurses needed, shifts required, etc. After company completes the form for job posting, he will review the hourly price of nurses as per his chosen shift and submit form.The service providers will receive a notification provided they match the criteria. Nurses can view the list and details of jobs posted according to matching criteria like location and skills. Nurses have right to accept or decline the job offer. Once a nurse has accepted a job offer, they will be able to contact company as there will be contact number and email id available. Nurses can manage their availability in calendar.In calendar for each day there will be 4 shifts i.e. Day Shift, Night shift, weekend day shift and weekend night shift. This availability of services providers will be displayed on front end. Admin will be able to manage the companies, nurses, job offers, earnings and contents through website admin panel. 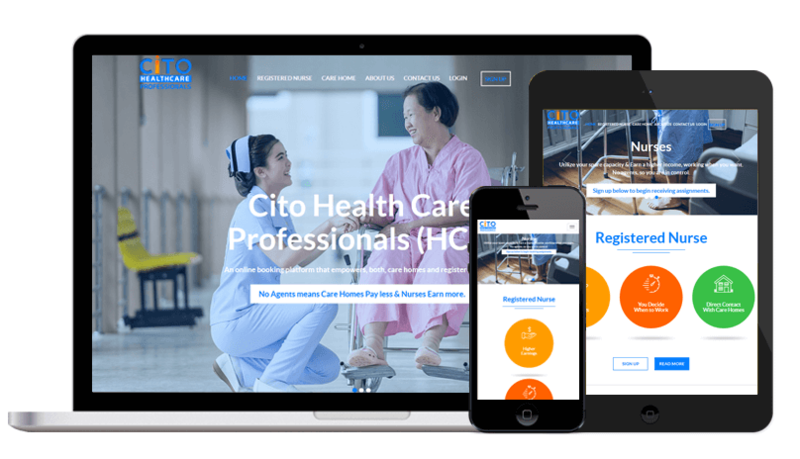 Cito health care professionals has chosen us for our ability to develop complex website and providing efficient solutions with logical approach to the requirements. The website has only single version that is running successfully from the date it was released.